Why do you need to build a new one past your mockup? The mockup I have now was assembled to explore string layout and position. It was made by modifying an old triple neck slide guitar with a chapman stick and a familiar six string guitar. There are inherent hardware problems with shape and size that can not be overcome unless it's all built from the ground up. Slide bars under strings can not be moved without going severely out of tune. String widths and heights are dictated by the original design of the triple neck and cannot be overcome unless redesigned to accommodate custom sliding bars under the strings. The usable keys are restricted in performance to only those tuned before any bars are moved... thus being locked into just 3 keys of C Major, D Major and G Major. It prevents wider composition outside of those keys. The new construction addresses all these issues allowing the full range of keys and chord changes to be made in tune instantly. It also allows shift from major to minor and back in an instant. The automated tuning gears are crucial to focusing the harmonic factors which the instrument is designed to present. The instrument produces overtones that are focused with very minute changes, sharp and flat, of specific notes in a chord. The only way to control this complex harmonic structure across all chords is with custom software... The selection and programming of recallable fine turnings is imperative to achieving what the instrument is designed to do... ringing absolute like a bell or muting selective overtones for unique chordal effects. Controlled sustain and harmonic resonance is a main feature of the instrument. Only with software control of tuning and filters can the full range of nuance be amplified, focused and brought into the sonic picture. The parameters that allow this are complex and interrelated thus needing programming from a sensitive ear. It allows the instrument to sit precisely on the edge of sonic feedback ready to output a series of related harmonics into the performance at any level desired. The audio science behind these key features is extensive but within the realm of my expertise and more importantly my fascinations. I can't wait to harness all this audio magic onto one play surface to bring about a new sonic territory that will certainly allow new music to occur. The ability to control the noise inherent in live strings is also crucial. Each string must be digitally processed to remove noise and enhance tone. With as many strings as there are on the instrument, this is a formidable task that only extensive programable software control can render useful. Digital sound modeling layered with the natural string tones is another major aspect of the instrument's abilities to craft completely unique sounds. It needs to be applied to each string and is itself a very complex array of specific parameter programming only found within software implementation. 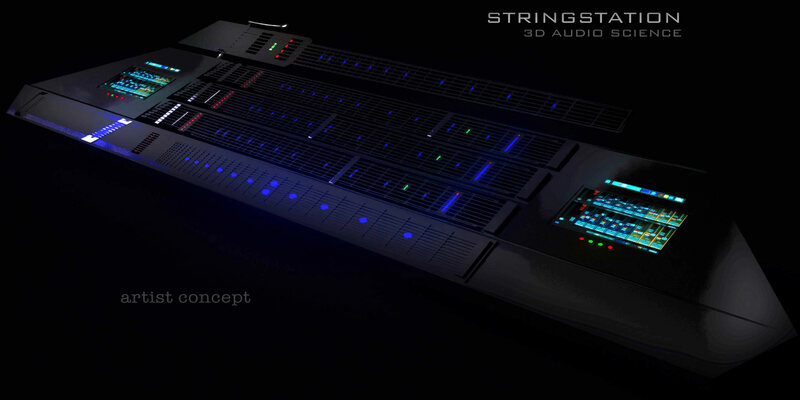 It will allow individual strings to be put through digital filters that can replicate or fabricate entirely new sound. Here is where the imagination of the art comes in, bringing a new ability to craft custom audio in ways never known before, a very exciting potential. Is the sound and music in the video what the finished intrument will sound like? No, Not really. The software control and programming will open an endless new pallet of audio possibilities that boggle the mind. I am very excited to program it all into what I have imagined. The music itself is also a big part of the expedition and I have been devising ways to remove myself from musics I've heard and reach deep inside to discover something new. Is the music in the video what you are going to make? NO, Music in the videos are off the cuff improv jams to show the playing techniques of the string layout. I just liked how it showed some of the performance techniques I've been working on like the harmonic rolls and bass playing. The new music I've been dreaming of with the completed instrument will be a different world! Are you going to make them available to buy?